We’ve made a lovely strawberry frosting before, and while it is amazing and just right for frosting on a cake, it’s difficult to get a lot of strawberry flavor into the frosting without compromising the texture and thinning it out (unless you want to use some sort of artificially-flavored strawberry something, which we generally don’t want to do). The solution is, of course, to use freeze-dried berries! Whoever thought of this is brilliant. You grind the berries to a powder in the food processor, and simply beat the powder into the frosting. 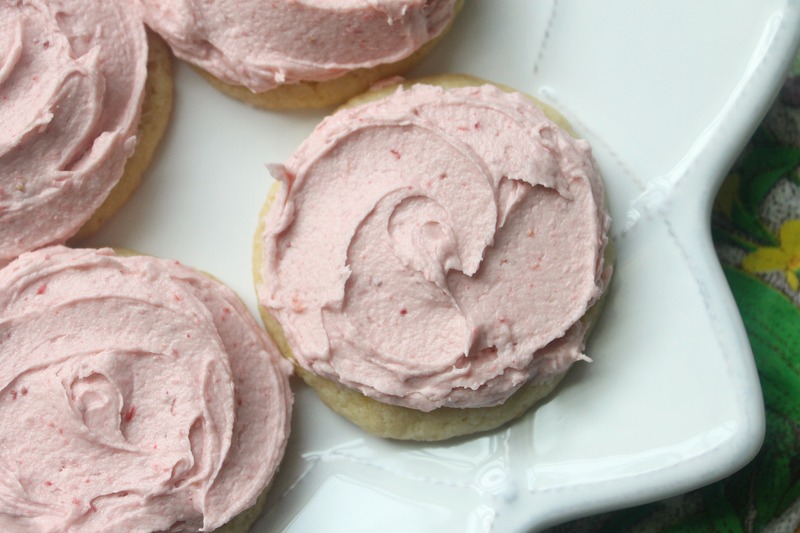 It’s really that easy, and the result is a fresh-tasting strawberry frosting that is perfectly fluffy. Top a soft lemony cookie with the frosting, and you have a delicious and extremely simple dessert that is perfect for everyday and elegant occasions alike. Simple is best for us right now, because we’ve been very busy with work, babysitting, and preparations for college! P.S. An unmentioned family member lost my beloved 50 mm f/1.8 lens at graduation, and I haven’t been able to track it down yet/order a new one, so I’ve been stuck with the kit lens and lower quality photos. Hopefully I can replace the lens soon! Preheat oven to 350F. In a small bowl, whisk together the flour, baking powder and salt. In a large bowl of a mixer fitted with paddle attachment, cream together butter and sugar until light and fluffy. Add the egg and yolk and mix until smoothly combined. Add the extracts and zest and mix until combined.Gradually add the dry ingredients and beat on low until just combined. Roll dough into balls and flatten slightly. Place dough a few inches apart on a parchment-lined cookie sheet and bake for 9-11 minutes or until just set on the edges. Chill dough in between baking each batch. Allow cookies to cool before frosting. Cream the butter with the strawberry powder and 2 cups of powdered sugar until fluffy, 2-3 minutes. Add a splash of milk and the rest of the powdered sugar gradually until frosting is smooth and spreadable. 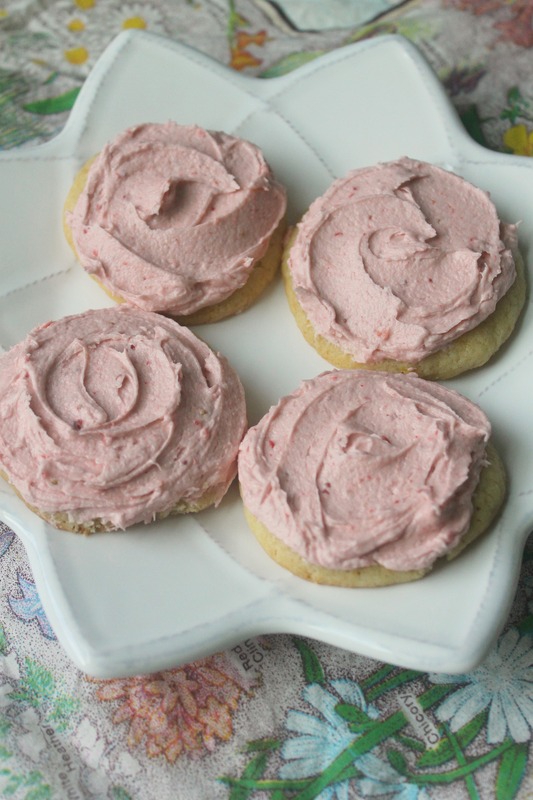 Spread frosting onto cooled cookies. Enjoy!